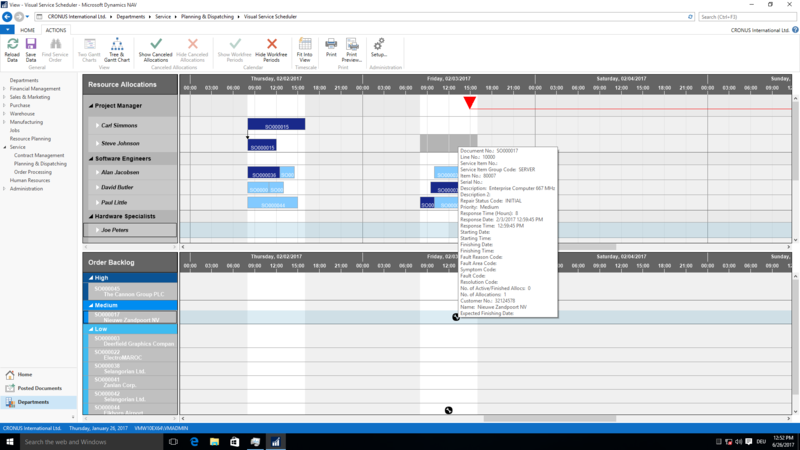 The Visual Service Scheduler is a fully integrated add-in for Dynamics NAV. It visualizes service orders, service item lines, and resources and achieves an easy visual service dispatching. 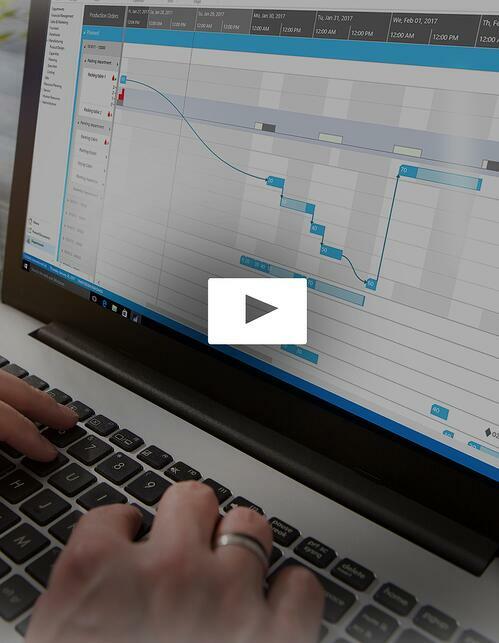 Here is a short video so that you can get an idea how to assign a service order from the right-hand order backlog to the service schedule via drag and drop. The Visual Service Scheduler is clearly structured into the order backlog (unassigned tickets) and service schedule (orders assigned to resources). That way, you can visually and hence easily manage all orders and assign them to the appropriate resources accordingly. The VSS lets you assign service tickets to resources and to resource groups. In order to manage the respective capacity, you can select to show a histogram below the service schedule. A histogram is a resource load chart and visualiizes the utilization of a resource or a resource group. Managing service orders via drag & drop is the one thing; keeping your SLAs is the other thing. Hence, the VSS visually flags late orders. However, for those of you, who cannot afford late orders, we provide an own view with a specific focus on the response date. 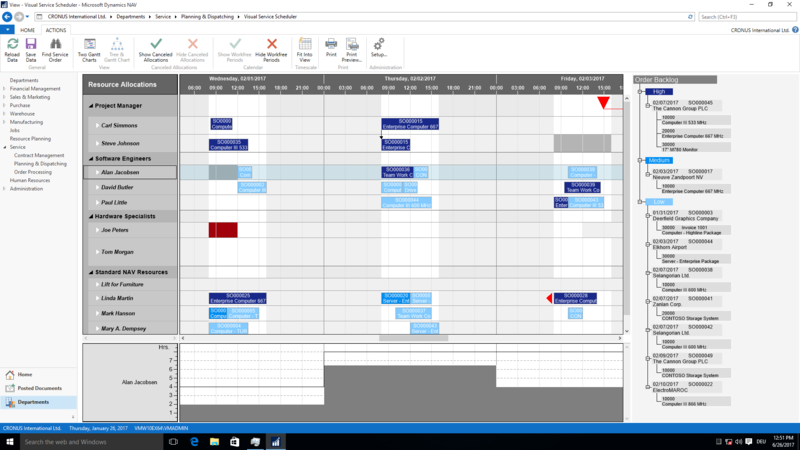 Want to offer the Visual ServiceScheduler to your clients? Want to partner with us? 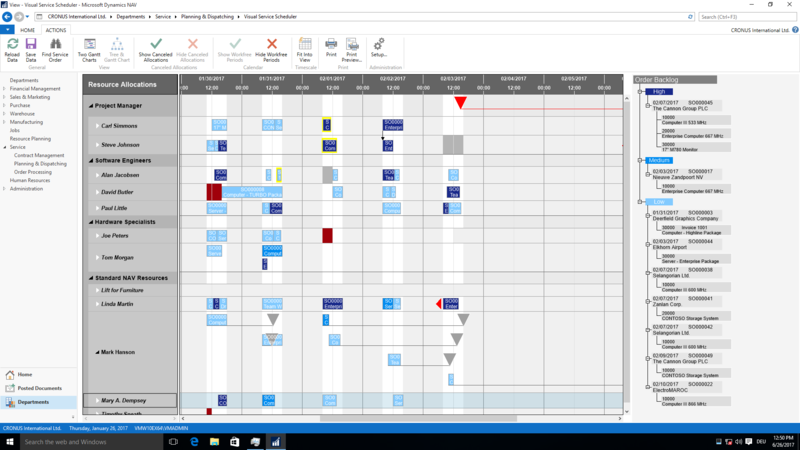 Move service item lines from the 'not yet allocated' area to the service schedule—either from rom the right-hand service order backlog to the service schedule or from the lower to the upper Gantt chart. As such create new resource allocation entries. Change the duration of the service tasks interactively. Also, change the allocation to service resources by vertically moving the service item allocations. In the standard view with the tree and Gantt chart: click on a resource or resource group to see the resource utilization as histogram below the Gantt chart. This helps you to immediately understand the impact of changes in the service schedule on your overall resource utilization. For resource groups (such as in the left hand screenshot), the VSS will show the aggregated resource load. 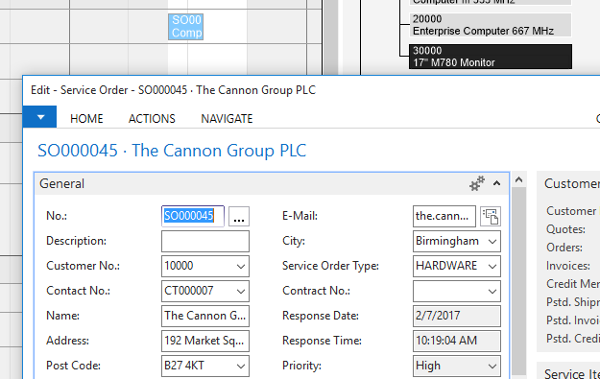 In the standard Dynamics NAV tables and the standard dispatch board, you either can see the assigned service orders or the unassigned service or the resource allocations. 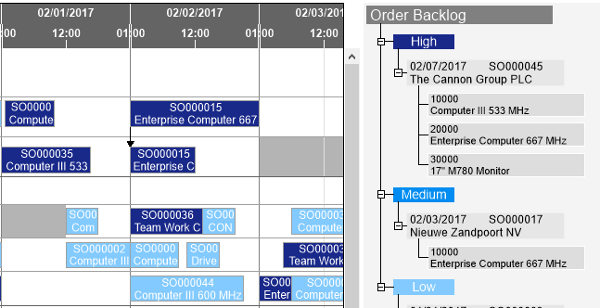 The VSS offers an integrated view on your entire service schedule and hence enables a holistic service planning process: the tree on right hand side shows all not yet assigned service tickets whereas the Gantt chart on left hand side displays the service schedule. This is the timing of the service orders as well as responsible servicer resources. Are you familiar with the following: you scheduled a service task when your customer calls and asks if you could send two people so that they will be onsite half of the time than initially scheduled. In addition they ask you if you could deliver the service one date later than planned. Any idea how complicated it is in standard NAV to exactly achieve this? With the VSS, it is as simple as shown at the left hand side: split the service item allocation, move one part to another resource, link them together, set the link to parallel and then move the entire task. 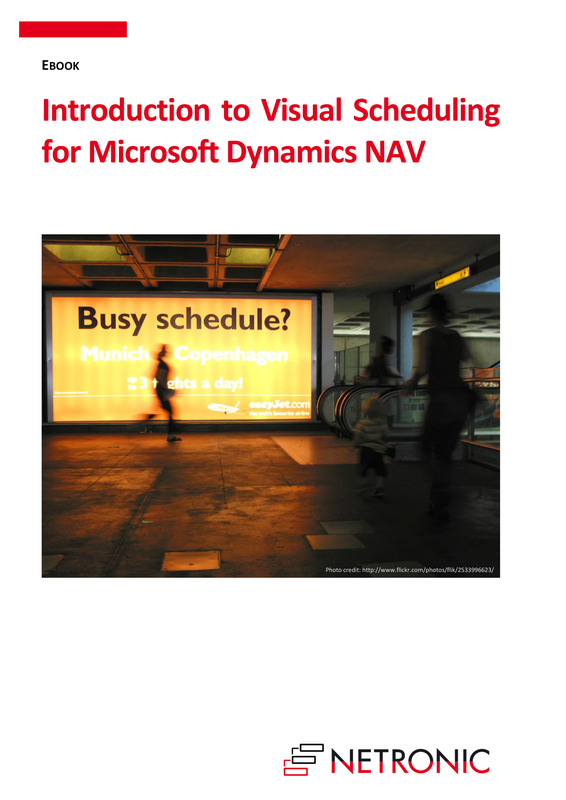 The Visual Service Scheduler is a fully integrated add-in for Microsoft Dynamics NAV. It opens as NAV page and does not require from the users to learn any kind of new menus, icons, symbols, etc. Double-clicking on a not yet allocated service item will, for instance, open the respective service order card with the corresponding service item lines. Likewise, double-clicking a resource will open the corresponding resource card. Have a closer look at the Visual Service Scheduler and see how it completes your NAV offering. Sign-up for an upcoming webinar. And see why hundreds of global Dynamics NAV partners already resell the VSS.